Adherence is the measurement of an agent’s logged on time, how the agent’s time is utilized, and compliance with schedules for lunch, breaks, etc. This particular measurement causes all manner of friction for many Contact Centers. Far too often Contact Center managers set objectives using bad data, or worse, data taken from someone else’s Center or from some “study” they read. While agent availability is a key success factor, it must be assessed and measured according to the unique attributes of YOUR Center to have any real merit. When one looks at current practices around adherence, approaches vary significantly. For some it is simply whether the agent logs in/out on time and takes/returns from break on time. This is often done as a function of the Workforce Management System (WFM) which provides real time visibility to agent status against previously established agent schedules. Most ACD (Automatic Call Distribution) systems provide a supervisor interface to monitor agent status in real time and may set a threshold for time in state. The WFM system alerts supervisors to an agent being out of adherence to their particular schedule in real time by changing the color of the agent’s cell on the screen or some other similar function. These mechanics are designed to allow management to improve its control of an agent’s availability on an intra-day basis (which in turn improves Service Level, Abandon, etc.). Unfortunately, the communication around this particular level of performance is often reduced to treating grown up and working adults to interventions more familiar in grammar school or factories during the industrial revolution. I coined “contribution to capacity” because I felt it better described where the responsibility for availability really needs to be – with the agent. The Contact Center lives by the development of a capacity model that is designed to accommodate the “demand.” This takes much time and effort and is a management duty, whether it falls to analysts, supervisors, etc. This takes a lot of work! The forecast must be accurate and the schedules well-planned. Non-phone work, training, coaching sessions, team meetings, absences and the like must be calculated, funded, and of course managed. But the key to success is in the hands of the scheduled and NOT the scheduler. If your staff shows up late, goofs off all day, or does not show up at all, you will not meet your objectives no matter how perfect the planning process. So of course, agent adherence is critical. But the breakdown is that there is a gap between what management works toward, wants, and needs and how agents understand and respond to that need. I believe that “adherence” sounds like something others make you do, where “contribution to capacity” clearly comes from the contributor. Am I proposing simply changing a term? No, I am proposing structuring a program in which each individual enjoys clarity around their role and the impact of that role on the overall achievement of the ContactCenter. Here are some thoughts to consider. Study agent time percentages. “Contribution to capacity” continues to measure logged on time, tardiness, breaks, and lunch. 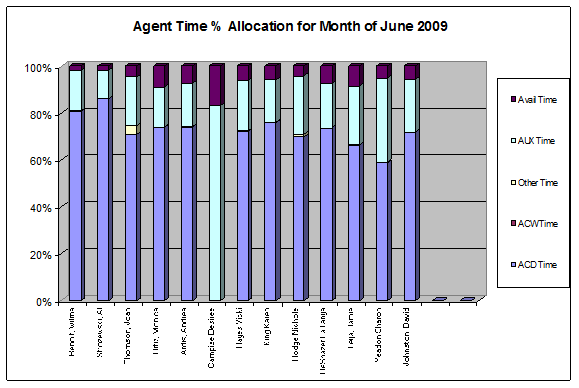 However, it also includes how agents spent their time on a percentage basis. This is accomplished by taking logged on time and looking for the report that provides percentages of time in state – Available, Talk, After Call Work, and Idle (also referred to as AUX/Other depending on the manufacturer). In most cases, the Idle state can be further deconstructed via codes to identify time spent on making outbound calls, doing non-phone work, handling emails, etc. Many vendors now have this report as a standard in the ACD reporting package; some have a graphic version available as well. Below is a sample of this output. This assessment follows the confirmation of on time arrival. Study thirty days worth of data. To establish ranges of acceptable time in state, examining thirty days of data is a far better measure than absolute targets in today’s more complex business environments. Use output from an Erlang C calculator. The use of the Erlang formula establishes a framework for agents to understand. When agents are on the schedule but unavailable, the customer suffers in terms of a longer delay. As well, other team members and other agents now carry a load greater than was intended by the plan. Agents must understand the role each individual contributor plays in achieving Service Level. OCC represents the percentage of time agents spend “utilized” during the sample half hour. Look carefully at what happens to occupancy as number of agents goes down. OCC goes up which means that each person is doing more. Service Level also drops; this increases delay for the caller. Help agents connect the dots. Any human being mature enough to be hired by your operation is capable of understanding on time arrival and of managing their time. It is whether or not your message is constructed in a way that puts the onus on the individual to contribute rather than on the system to “monitor” for “adherence.” Assist staff to understand the “contribution to capacity” concept. Show them that customers face the same frustration as they do when as consumers, agents are kept waiting in the grocery line, at a restaurant, etc. Balance your time in monitoring the queue. Keep in mind that Contact Centers are not baby sitting units. Every moment a supervisor spends trolling the WFM or ACD interface for intraday adherence is valuable time that could be spent coaching, evaluating a process, or participating in a project. I am NOT saying that monitoring the queue in real time is unnecessary. I am simply suggesting balancing rather than obsessing over intra-day adherence. Being tied to a machine that sends supervisors in “goose step” to intercept an agent’s state is of questionable value. The most insane thing about it is that adherence often doesn’t change over the long-term. If your method for adherence works so well, how come you have to keep doing it? Look for performance plans that change behaviors for the long term! Have agents track their own time. Want results? Make agents responsible for a weekly report on their own “contribution to capacity.” You will be amazed how “into it” they will become, and even competitive. Your ACD reporting system and even your WFM system can be programmed to send these reports to individual agents every morning. When you meet for coaching sessions, consider reviewing “contribution to capacity” performance as well as the quality of the transaction and interaction. This presents a consolidated model of coaching to overall performance. Hold them accountable. All too often, there is a link between an agent’s availability and performance. And actions can be slow and inconsistent. When it comes to “contribution to capacity” we all know that things can happen; 18-wheelers roll over on highways, buses and trains run late, etc. But chronic tardiness and lethargic performance are simply unacceptable. Leaders must deal with these issues head-on and promptly. Check your HR policies and make sure that your entire management team understands them and uses them. If you have people with consistently poor performance and inconsistent “contribution to capacity,” set up the “tardy team.” This may seem a bit like the use of a dunce cap. But if maturity to perform is not present, repeated efforts yield no improvement, and HR policies are so convoluted that you can’t fire them, put them all on the same team and see what happens! At least these folks won’t be polluting the rest of the population! Seriously, training, communication, and management practices focused on the “contribution to capacity” concept will go a long way to reducing poor performance linked to lack of availability. Good Luck! And if you want any discussion or assistance implementing a “contribution to capacity” model to replace your current “adherence to schedule” efforts, just let me know. I would be happy to help!